An upscale neighborhood of less than 50 homes in District 2 where students attend Boiling Springs Elementary, Junior High and High Schools. These homes are of newer construction within 5 years old. There is also some new construction homes as well. Enjoy the upgrades you will find in these traditional custom built homes with open floor plans, gourmet kitchens with granite countertops, crown molding, bonus rooms and more. Home prices range from $300 to $400,000 and range from 2800 to 4000 square feet. Residents in this neighborhood pay an annual HOA fee of $500.00 and enjoy street lights and swimming pool amenities. Enjoy living in the heart of Boiling Springs where you will find everything you need for daily life and fun. Take a 10 minute ride north and you are at Lake Bowen and enjoying a day at the lake. 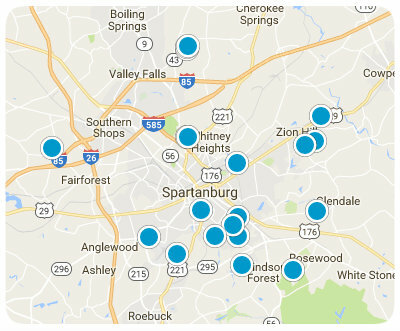 Also conveniently located to Interstates 85 and 26 for those trips to Greenville, the mountains or beach.